Automatically create unique applique, cross-stitch, border, and embroidery designs with just a few clicks through the wizards with Amazing Designs Digitize ´N Stitch Embroidery Software. 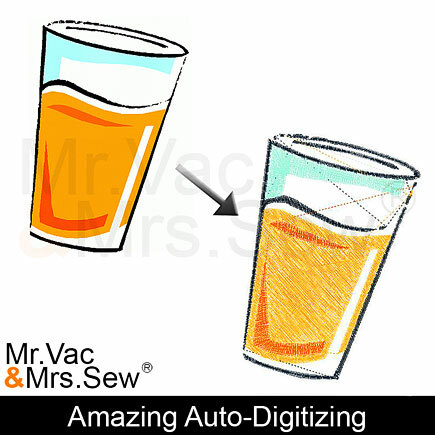 This auto-digitizing program lets you bring in your favorite simple clip art or scanned images and then convert them to stitches. No matter the look you want in your embroidery, you can create it with Digitize `N Stitch! Create You Own Designs with the Amazing Designs Digitize 'N Stitch! With just a few simple clicks Digitize 'N Stitch will automatically take simple artwork, such as clip art or logos, and transform it into a beautiful embroidery design. You are no longer limited to what you see online or on CD's. You can now embroider that exact design you were looking for without compromise. Express your creativity with Digitize 'N Stitch. 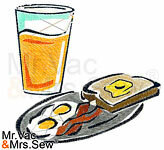 The clip art of orange juice on the left was converted into an embroidery design with just a few clicks! 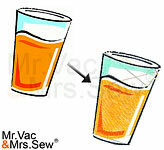 You can see how crisp and almost identical the embroidery design looks compared to the original clip art picture. Digitize 'N Stitch allows you to merge a pre-digitized design with a newly created design with ease. You can also have more than one design page open at a time and cut, copy and paste between the design pages. 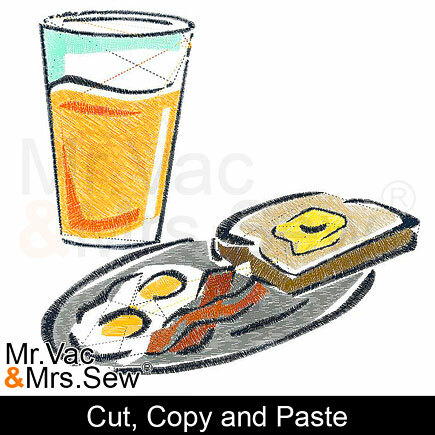 The picture on the left shows that you can easily merge the digitized orange juice design with a breakfast design to make a meal. 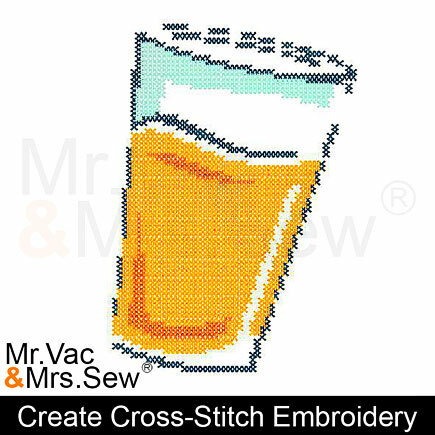 Digitize 'N Stitch gives the user the ability to their logos, clipart and more and transform it into a cross-stitch embroidery design. Using “X” patterns, Digitize 'N Stitch combines different colored “X”'s to create a design. 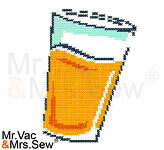 Cross Stitch is a well recognized style of embroidery and makes the design look as if it was hand sewn! With Digitize 'N Stitch you can design your own border, applique shape or use any of the 40 built-in shapes to further embellish your designs. Having Trouble? No Problem! Digitize 'N Stitch has easy to follow wizards that guide you through the whole design creation process step-by-step. 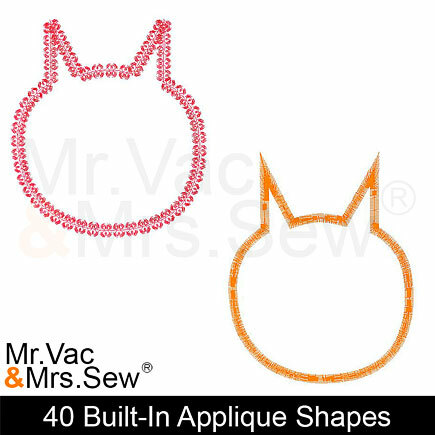 What to spice up your Applique? Adding some style to your applique is simple with Digitize 'N Stitch because has 301 icon designs or 188 decorative stitches you can add to your design! You can choose from a variety of borders for your applique including satin stitch, e-stitch, even shamrocks and stars! Want to apply an applique to portions of your design? Digitize 'N Stitch has got you covered! Digitize 'N Stitch has a Magic Wand Tool that will instantly apply an applique to entire design or portions of a design. Digitize 'N Stitch also allows you to apply more than just one portion of applique, giving you multiple appliques within the same design. Digitize 'N Stitch also allows you to change the cross-stitch size per inch so your design will match perfectly with your Aida Fabric. Digitize 'N Stitch also allows you to adjust the size of your graphic which will also change the size of your finished embroidery. Digitize 'N Stitch allows you to type in the exact measurements you one so there is no guesswork as to how big your embroidery design will be! 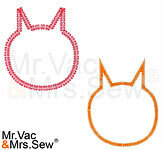 Want to see what your design will look like before you embroider it? Digitize 'N Stitch has Realistic Design Preview which simulates the stitches in the design so you know exactly what your designs will look like. You can also choose the background color and fabric type in the simulated preview. Digitize 'N Stitch can be combined with Edit 'N Stitch and Personalize 'N Stitch to expand your editing and personalizing capabilities. Digitize 'N Stitch accepts a variety of digital artwork file types including: Vector, EMF, WMF, BMP, JPG, PCX and TGA.